I am often asked the question "Are you going on to become a priest? You'd be wonderful at that!" While I feel honored that people would like me as their priest, that is not the vocation I feel deeply called to follow. In the Episcopal Church there are three ordained orders: Bishop, Priest, and Deacon. Each role has a special place in the structure of our Church. A Bishop provides leadership and guidance to the parishes within their Diocese, and sometimes outside the Diocese. A priest provides the same kind of leadership and guidance within the parish (or other organization) they may be assigned to shepherd. The Deacon has a unique role within the Episcopal Church. This vocation has only recently been reinstated as a full and unique order thanks to the 1979 revision of the Book of Common Prayer, but dates back to the time of the Apostles, with the Act of the Apostles reporting the appointment of the first seven deacons, including Stephen and Phillip. While Diocesan Delegates elect their Bishop, and a Parish calls their Priest by an election at a parish meeting, Deacons are appointed by the Bishop to serve where the Bishop sees a need. Most Deacons are not paid a salary, and are either retired, or support themselves through secular employment (as I do). This appointed, non-paid position gives the Deacon a certain freedom of action to follow where the Spirit is calling the Deacon, and their community, to go. It is this freedom of action within the Spirit that really spoke to me about following this path. Don't hear me wrong! This freedom doesn't give the Deacon a license to do or say whatever they want!! Deacons serve under the guidance of the Bishop, and also must carefully consider the needs and concerns of the community within the Church as well as the community outside the Church. At the central core of any Deacon must be a life of prayer and study that focuses the Deacon's innermost being on listening to what God is saying through the Spirit. Any good formation program for Deacons helps the student find that central, intersecting point where the Deacon is open to the needs of the Church, the calling of the Spirit, and needs of the community. Deacons are inside the Church, but also outside the Church. Deacons work at careers of their own, but also live a vocation of their own. Deacons speak from the pulpit, but also speak on the street corner, or in government meetings, or at social gatherings. Deacons roles continue to evolve within the Church, and Deacons are constantly listening for the guidance of the Spirit. I often connect my life as a Deacon with the life of St. Paul, who worked as a tent maker while spreading the Word of Jesus throughout the Mediterranean world. People were not always happy with his admonitions, but they understood his commitment to his call. At times I wonder how often he made or repaired a tent as a gift to someone in need. 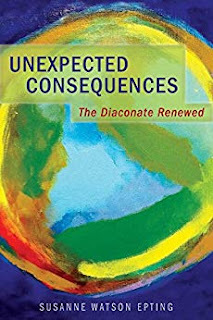 Since this role of Deacon within the Episcopal Church continues to evolve, I highly recommend "Unexpected Consequences" (by Susanne Watson Epting) to give those who are interested in exploring this path of Deacon an idea of how the role has grown over the years.